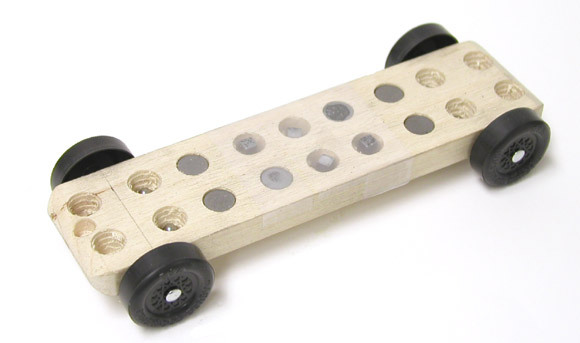 Most pinewood derby races specify five ounces as the maximum weight. Ensuring that your car weighs five ounces is an important factor, as tests have repeatedly shown that top performance is achieved at this maximum weight (see “Weight Experiments”, in Volume 3, Issue 14: March 31, 2004). But what if your race rules allow more weight? Should you weight your car beyond five ounces? If so, how heavy should you go? Weight position (balance point) – as the balance point is set more aggressively, additional weight is shifted to the rear wheels, putting more wear on these wheels. Lubrication type – as can be seen in this experiment, the type of lube affects the amount of weight that can be used. Wheel type – lighter weight wheels will tend to deform under heavier loads. Pinewood Wizard body – This body allows the weight to be easily changed. Two sets of Ultralight Speed Wheels from Maximum Velocity – These official BSA wheels weigh 2.2 grams, and are machined with a high level of accuracy. They are structurally strong, so they can carry additional weight. Two sets of Speed Axles from Maximum Velocity. Tapered tungsten cylinders, and various other tungsten weights. 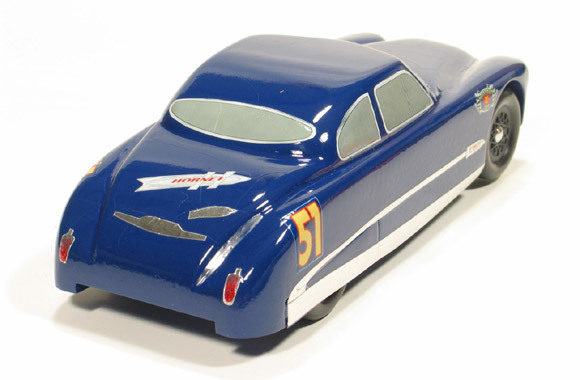 Car BodyThe Pinewood Wizard body was set up to weigh 5.0 ounces with the wheels and axles. Additional cylinders and smaller weights were incrementally added to achieve the desired weights. The car was centered weighted1, and all four wheels were running on the track (see Figure 1). The wheels were used right out of the package. The axles were lightly polished and then lubed. The wheels/axles were installed on the car, and the alignment was checked to verify that the car rolled virtually straight. One set of wheels/axles was lubed with Krytox 100. The other set was lubed with Tube-O-Lube graphite. A 32 foot aluminum Freedom Track was used with a Judge Timer. For each run the car was staged in the left lane. Three heats were run at 5.0 ounces. One additional ounce of weight was added, and three heats were run. This was repeated up to 10.0 ounces. One ounce of weight was removed, and three heats were run. This was repeated down to 5.0 ounces. The following charts show the results of the test. The plots show the results with the high and low run removed for each weight. For graphite, maximum performance for a center-weighted car is reached at about 9.0 ounces. Likely, the maximum weight for a rear-weighted car would be less. The 6.0 ounce result appears odd. Possibly, the graphite required more break-in time, so the car was not performing at peak until the 7.0 ounce runs. The last three runs at both 5.0 and 6.0 ounces were better than the first three runs. For Krytox, the results are inconclusive. Performance continued to improve through 10 ounces.2 Additional tests with a different test body would be needed to determine the maximum weight. 1Testing for the maximum weight with a rear-weighted car would be problematic as the weight would need to be added in such a way that the balance point would not be affected. The test vehicle would need a device to move the weight back and forth in small increments to adjust the balance point at each test stage. A method of accurately measuring the balance point would also be needed. 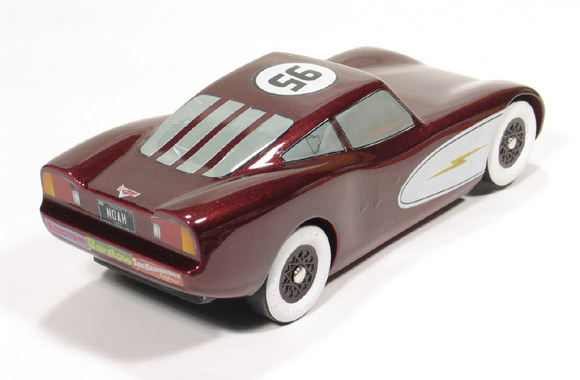 2Ten ounces is the maximum weight the Wizard car can hold without changing the aerodynamics. 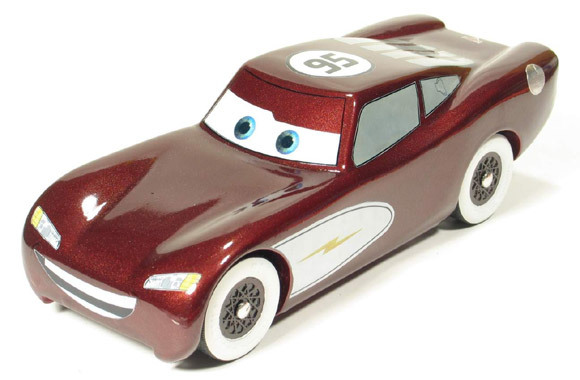 In June of 2006 when my son Noah and I left the movie “Cars”, Noah told me he wanted to make the Lightning McQueen car next year for the Cub Scout, Pinewood Derby. I was thinking the whole time that lightning McQueen has a lot of stickers that I would need to resize to get them to work with a pinewood car. 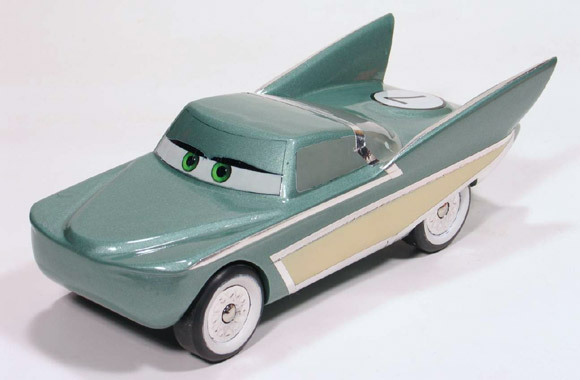 When we were working on the design, after the movie came out on DVD, Noah decided to make the Whitewalls McQueen (a.k.a. Cruisin’ McQueen) instead. I was relieved. 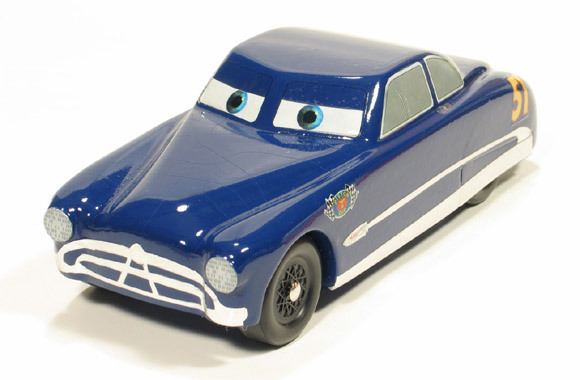 But then we decided to make a car for Mom (Flo) and me (Doc Hudson). I had worked hard getting the plans to fit the max width of 2-3/4 inches, the max length of 7 inches, and the standard Cub Scout pinewood derby wheelbase (Flo has an altered – shorter – wheelbase). 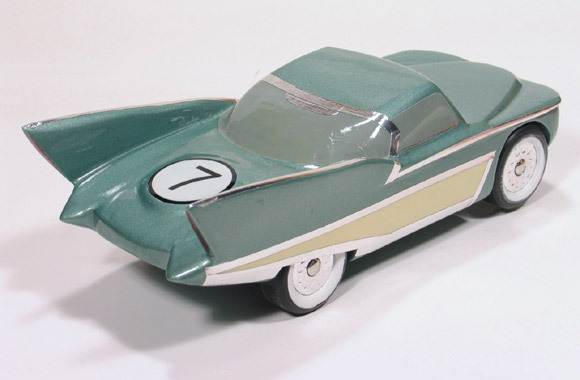 Both the parent cars have fender skirts, which forced me to remove the lettering on the outside of the BSA wheels to get clearance around the wheels (this would be illegal in our council race – raised lettering may not be sanded off). All of our cars use Matched Speed Wheels from Maximum Velocity. In the last week, before the derby, we worked a long time to get the cars ready. I ran out of clear before my car was done and “Wally World” does not sell Testors any more. So I purchased some of their new supplier’s clear. I tried it on a small area and it did not have any problem, so I cleared the entire car. About an hour later the car started to develop large cracks in the paint (lesson learned, always use paint and clear from the same supplier). I worked until 2:00 am the night before the race to get my car completed (even though it still does not have bumpers –maybe someday). At the races another father and son made Mater and The King as their cars. Our cars did well in the races: Noah was 1st place in the Wolf den, 2nd fastest in the pack. All of the scout and parent cars were beat by a pink car (sister of one of the boys) in the Cub/Parent races. Thanks for all your quality products, and good advice! My name is Joe Bilyeu I am the proud father of twin 8-year old boys, Hunter and Dylan. Last year at the BSA derby races we were totally embarrassed. We built two nice looking cars, but they were as slow as a turtle. We got beat by every car in the district. My boys almost fired me. So this year I vowed to redeem our good name. I read everything I could find on derby car racing (thank you Maximum Velocity for the helpful hints). We worked months on our cars. The boys painted, polished, and shined; raised a wheel, aligned the car, and installed red micro lights. It was worth it all. Out of our pack of twenty-two boys, Dylan’s car took first in his den and first in the pack. Hunter’s car took second — his only loss was to his brother. We couldn’t wait until the district race. The boys were so excited. The night of the district race, I knew we had two fast cars. I also knew I wanted them to be separated from each other in the elimination brackets (so one wouldn’t eliminate the other early in the event). There were fifty-nine cars entered. At weigh-in they gave us number 146 and 149; I didn’t think that was very far apart. At the final heat our pack was there rooting us on. In the first heat Dylan’s car took first and Hunter’s car took second. The second heat was the same. In the third heat Hunter’s car took first, followed by Dylan’s car. The crowd went wild; the twins had won first and second in the District! What kind of glue do you recommend for gluing the axles in? After inserting the axles and making sure that you have them exactly where you want them, put a dab of white glue or carpenter’s glue in the slot between the tips of the axles. Spread it over the top of the axle, then wipe off the excess. Keep the glue away from the wheels, and leave the car on its back until the glue dries. I don’t recommend Super Glues (can run into the bore and lock up the wheels), or Epoxy (makes the installation virtually permanent – very difficult to remove the axles if needed). The block of wood from the BSA kit has precut wheel positions. The length of one end is longer than the other. Most cars I’ve seen use the short end for the nose. My grandson’s pack and district allow cars to be 7-3/8 inches long and I plan to add the additional 3/8 inch to the long end. The track they use is from BestTrack with a transition radius of 48 inches. My question is that with the longer nose do you think the nose will hit the track during the transition? Also what effect will this longer nose have on stability? Not to say that it couldn’t happen, but I have never seen a case where the nose hits the lane guide. In fact some people cut off part of the short end, and glue it onto the long end, increasing the length of the nose even further. Regarding stability, since the wheelbase is not changed, the car should have no change in stability as long as the balance point is not too aggressive. Our district is having a Big Rig competition this year. One of our senior members remade the 18 wheeler kits from years ago. The problem is the axles. He gave everyone standard nails to use. Do you have any suggestions for a better starting point than a nail? Yes, I recommend our 18-Wheeler Axle set. It has 9 long axles and 3 standard length axles (one spare of each. the axles are clean (no flaws) and have a pre-beveled head.